According to the American Kennel Club (AKC), the breed known as English Bulldog gets its name from the dog’s use as bait in dog fights. The original animals were courageous, ferocious and almost insensitive to pain. Dog fighting eventually became illegal in the British Isles. Lovers of the breed worked to preserve the English Bulldog. They bred the dogs over a few generations to eliminate their fighting characteristics and make them agreeable companion dogs. The bulldog standard in the United States is 50 pounds for males and 40 pounds for females. Accepted colors are white, red, fawn, fallow, brindle or piebald (patches of two colors). The coat should be short, flat, smooth and glossy. Bulldog skin is loose and soft, with excess looseness around the head, neck and shoulders. Bulldogs stand about a foot high at the shoulders. The head is large, extending as wide as the shoulders. The body is squat and the legs short with a straight or screwed tail. Bulldogs are considered family pets. They are part of the non-sporting group, meaning they are not bred for a particular sport or task like hunting, racing, herding or protection. Bulldogs are gentle, friendly, animals. They are courageous against threats but are not threatening themselves. A bulldog’s stature and presentation is dignified and peaceful in comparison to other breeds that are aggressive or playful in presentation. Bulldogs' lifespan is eight years. Miniature English Bulldogs are not a recognized breed by the American Kennel Club. There are no standards to define miniatures. Without standards, breeders are at their liberty in creating miniatures. Some breeders commit to the breeding of miniatures of pure bulldog. Miniatures can be bred by taking smaller full-bred bulldogs from various litters and breeding them together to get a smaller version of the standard breed. Given that bulldogs only stand a foot high at their shoulders, reducing their size will only take roughly an inch off of their stature. Miniatures should have all the characteristics of the full breed. When considering a Miniature English Bulldog puppy, you may find it difficult to determine how large the animal will be when it is full grown. If a breeder can demonstrate that both parents of the puppy are small-sized bulldogs, you many have a miniature version of a full-bred bulldog. 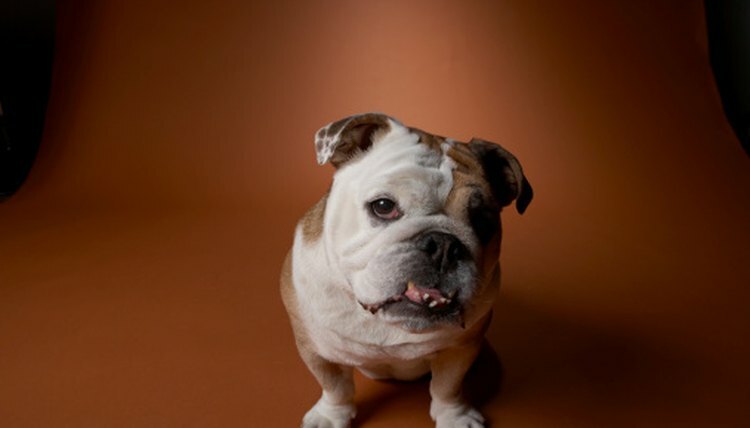 Breeders can mix bulldogs with other breeds to “downsize” animals. It’s up to you when adopting or buying a dog to distinguish the breeder’s motivation in raising miniatures.